The Diet Solution Program - Diet Reviews: Does The Diet Solution Program Really Work? 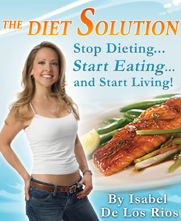 The Diet Solution Program was created by nutrition, exercise and lifestyle coach Isabel De Los Rios, who spent plenty of time researching weight loss and healthy lifestyle choices to help her overweight, diabetic mother. By using principles in her program, De Los Rios was able to assist her mother in getting off her diabetic medicines and lose 40 pounds. The comprehensive program is sold online, with all the information necessary to help dieters achieve their weight loss goals. Different packages are available to meet individual needs and budgets. The idea behind the Diet Solution Program is that everyone has a different metabolism type. To make weight loss efforts as efficient as possible, it is important to identify that metabolism type and then choose foods and schedule meal times accordingly. The metabolism type determines how an individual reacts to fats, protein and carbohydrates. In addition to determining and working within a metabolism type, the Diet Solution Program emphasizes a high variety of nutritious food and adhering to specific caloric amounts. Once you download the program, you will be asked to take a rather lengthy quiz to help determine your metabolism type. Once the questionnaire is complete, you will be classified into one of three categories; protein, carbohydrate or mixed. Based on the category you fall into, you will then be advised which foods to eat and which to avoid. You will also learn how to schedule your meals for best weight loss results. Every dieter will eat three meals each day, plus snacks in between. Dieters are encouraged to keep a food journal to help identify which foods seem to react best with your body, so you can adjust your meal plans accordingly. The program emphasizes organic foods and requires dieters to replace many common foods in the Western diet today with more nutritious fare. Detailed meal plans make it easy for every dieter to eat the correct types and amounts of food each day. Snacks that are included with the program include fresh fruits and vegetables, nuts and boiled eggs. One glass of alcohol is permitted each week; preferably red wine because of its health benefits. Dieters can also drink up to two cups of coffee each day, but the only sweetener that can be used is Stevia. Exercise is touched upon in the program but not promoted.